In the wake of massive wildfires that burned through the Sonoma and Napa areas last fall, Deana Clifford had a bad feeling. “I feel like we’re going to get a burned animal,” said Clifford, who is a senior wildlife veterinarian with the California Department of Fish and Wildlife and an assistant clinical professor at the UC Davis School of Veterinary Medicine. She mentioned her hunch to Jamie Peyton, chief of the Integrative Medicine Service at the UC Davis Veterinary Medical Teaching Hospital, who offered her expertise in pain management to any potential cases. A couple of weeks later, they had a patient — from the Thomas Fire in Southern California. A 5-month-old mountain lion had been repeatedly spotted by residents in the Ventura County city of Santa Paula. The cub, far too young to be alone, also looked to be limping. He was brought to a Department of Fish and Wildlife facility in Rancho Cordova for treatment, where staff got to work treating burns found on all four of his paws. “He was already starting to heal, but his paw pads were problematic,” Clifford said. 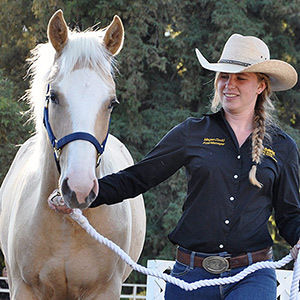 Peyton’s Integrative Medicine Service encourages vet students to combine traditional clinical techniques like antibiotics, with out-of-the-box thinking like acupuncture and chiropractic treatment. The mountain lion cub would end up receiving all that and more: His paws were treated with a salve Peyton makes from honey, olive oil, coconut oil and beeswax, and one was covered with tilapia skin as a temporary bandage. The fish skin, which to Peyton’s knowledge has never before been used on an animal, speeds up the healing process and has the added benefit of being completely harmless if it’s eaten by the cub — something that can’t be said about artificial bandages. She adapted the idea from a team using it on human burn patients in Brazil. “It’s the perfect idea to use for wild animals,” she said. Many of the techniques Peyton uses — like cold lasers and acupuncture — are commonly used on people, but veterinarians often stick to what they know, Peyton said. “We push people to think outside the boundaries,” she said. Peyton said she’s excited about the possibilities the fish-skin treatment represents, and hopes to research it further and someday use it as a treatment for companion animals. She’s hoping donors will step forward to help make more research possible. The mountain lion cub received a fresh tilapia bandage Monday (Jan. 8), applied by Peyton with the help of UC Davis veterinary students. “It really does seem to be helping the healing process,” Clifford said. The cub is continuing to recover at the Department of Fish and Wildlife facility in Rancho Cordova where his paws can be kept clean, but in two to four weeks, once he’s sufficiently recovered, he’ll be released into the care of Sonoma County Wildlife Rescue. He’s too young to survive alone in the wild, and that facility already has another mountain lion that needs a companion.